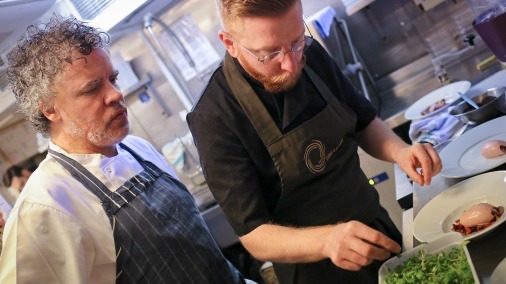 The innovative pair have produced a menu led by flavour - you will want to taste it yourself! Paul A Young is a chocolate alchemist, putting together audacious ingredient combinations and achieving something golden. His classic chocolates are divine, with impeccable technique. 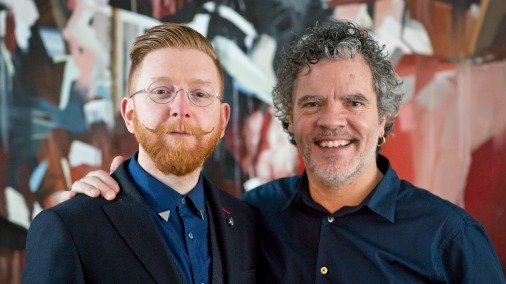 But in order to explore and create he has a history of collaboration with the most exciting fellow food innovators. And Paul’s innovation consistently throws up new and exciting things to try. At the heart of all is a dedication to the finest cacao, and showcasing all it can deliciously do. What a palate of possibilities! Peter Gordon, the godfather of fusion cooking, quite literally shook up all preconceptions about what ingredients married with what. He introduced countless new ingredients from the Far East to our shores – hailing from New Zealand they were more familiar to him due to their proximity to his native New Zealand. But what he did with them! That was a magic all his own. Now, many of the weird and wonderful things Peter introduced when he first arrived in the UK are commonplace, his influence on the current landscape of food in this country cannot be overestimated. It has been immense. So what happens when two such mavericks come together to cook you dinner? Something pretty spectacular! Attention is paid to our starter. Peter and Paul have form, having collaborated on a menu together three years ago. Their ease with one another – both personal and creative – was much in evidence on the evening I was privileged to try their chocolate menu. It is to be available at Peter’s Providores Restaurant on Marylebone High Street for the month of July. And while July may not seem like the obvious choice of month to release a chocolate menu, there is little that is obvious about the way these two go about things. The driving inspiration is the quality and diversity of the exceptional chocolate emerging from today’s finest makers. 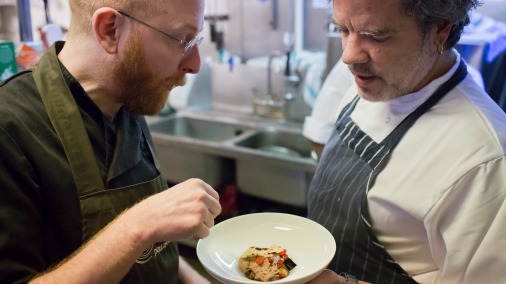 Peter and Paul sat down to taste some glories and chose which to work with for their menu. What you will not find are plates of food tasting of chocolate. The ethos is to use each of these as a starting point, as a flavour note, almost as you would seasoning, in a series of dishes. Original Beans 70% Virunga, pomegranate, coriander and ginger bloody mary (top right). First up is a cocktail, which blends pomegranate, coriander and ginger, with a warming bourbon. The chocolate here is Original Beans Cru Virunga 70%, which serves to round and deepen what is a very refreshing drink. It comes on like a crowd-pleasing ginger beer – but is altogether more grown up – in content and on the palate. I loved the earthy herbal touch of the coriander. 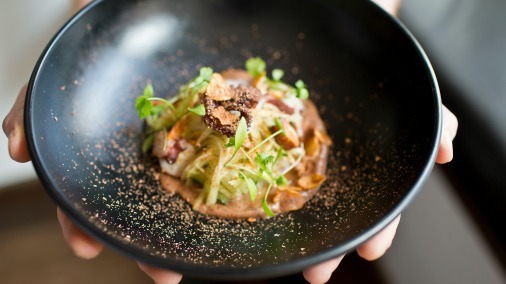 Duffy’s 65% Dominican Republic babaganoush, liquorice daikon, sesame cheese wafer, tamarillo. The first course is a babaganoush, into which some of Duffy Sheardown’s 65% Dominican Republic has been incorporated. This chocolate is a fruity smoky affair, and makes perfect sense in the dish. The babaganoush is creamily luscious, the affect of the chocolate is to make it deep and full, but there is nothing too rich. In this dish, and across the whole menu, the rich intensity is all in the flavours. There is nothing too dense – only a deft lightness of touch – combined with the kind of flavour intensity more common in much heavier-going plates. The addition of smoke, earth and zing, come from cubes of aubergine, the pop of pomegranate, and a delicate liquorice-poached disk of daikon. The final flourish, a cocoa nib dotted pecorino wafer, adds crisp, crunch and salt, and puts the seal on a blinding start to the meal. It sounds complex, a lot of elements, it comes together as a simple and joyous little thing to eat. Which could sum up the whole evening. Menakao 100% Madagascar, octopus, green mango, green papaya, chilli, lime, crispy garlic and shallots, 100% lime salted coconut. Next, a dish enhanced with the fruity intensity of Menakao Madagascan 100%. You would expect such a chocolate to come into play with something dark and meaty. The mavericks have created a fish dish, octopus to be precise. And it utterly works! As it is 100% the intense fruitiness of the cacao is more citrus-astringent than the typical red fruit, and its bright acidity is a zingy lift to the whole. As Paul said; “The thing I like about 100% is how clean it is”, and what a surprise that this can really work with the bright flavours of a fish dish. 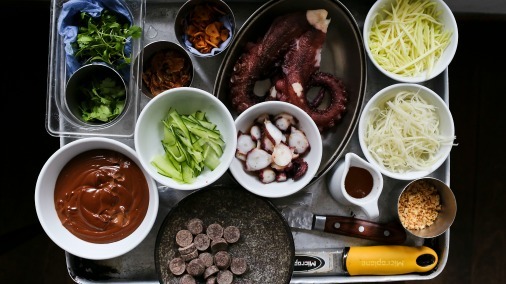 Octopus, perfectly cooked, is atop a thai style salad of green mango and papaya, itself atop a mousse of deep, earthy, umami, fishy, unctuousness. The chocolate is present in the mousse, but also as a light dusting peppered over the top. It is a dish of fabulous contrasts – plumming the fishy depths – and flirting with the lightest citrus notes. Soft, smooth, crunchy, with lovely bursts of intense flavour added by crisp shards of roasted garlic. Heaven! 64% papua New Guinea, seared den miso beef onglet, nibs, buckwheat, ginger, kohlrabi, shitake, tofu, 64% teriyaki. The meat course takes a lighter chocolate, a 64% from Papua New Guinea – a chocolate of complexity – with dark caramel notes and a marmite quality. 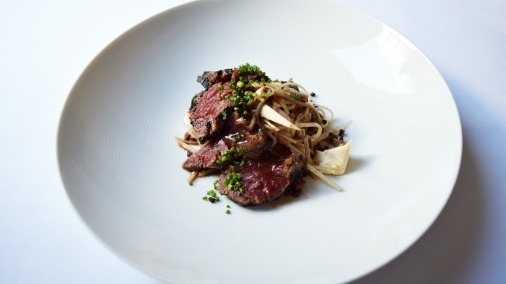 This echoes the pairing of seared den miso beef onglet, with the toasted flavours of both soba noodles and toasted buckwheat. Savoury married with comforting nuttiness. The chocolate is used with such a delicate touch here, to round out the flavours in a glorious teriyaki dressing. A beautiful tofu, poached in kombu seaweed broth, is a delicate creamy complement to the meat and noodles. Shitake mushrooms and ginger are both well-judged additions. And the noodles, with little crunchy bursts of intensely-nutty buckwheat lighting them up; slippery from the delicate fresh teriyaki sauce, just give me a king-sized bowl full please and leave me to it! One of the best things I have eaten in a long time! And you well know that I am quite an eater. The chefs fine tune dessert. Dessert was a challenge, as this menu is for July, and Peter and Paul didn’t want to end a meal with too heavy a dish, nor did they want to roll out the obvious chocolate dessert. What they have chosen to do is use white chocolate, a Valrhona Ivoire, to showcase how this misunderstood member of the chocolate family is also a worthy ingredient for a chef. Cocoa butter is a heavenly thing, and white chocolate brings that quality to a dish, the physical properties of chocolate, while allowing the chef a whole palate of possible ingredients, that would be drowned if the flavour of cacao was also present. 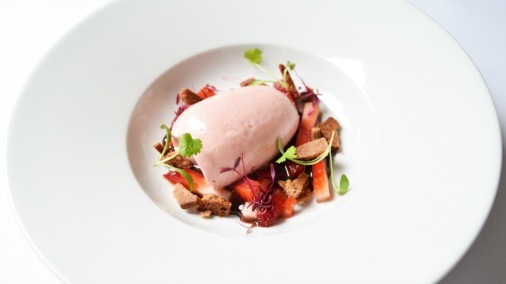 The dessert is an ultra-smooth strawberry mousse, the creaminess of which is down to the white chocolate. 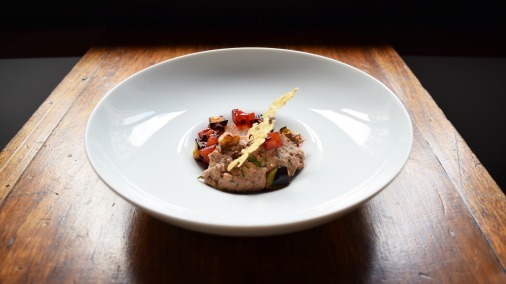 This is served with some of the fruit, a dark sauce of Valrhona 64% – from a cacao full of red fruit to chime in with the strawberries – pieces of crisp Original Beans Cru Virunga 70%, pink peppercorn, pepita and sea salt biscuit. There is dark and light, creaminess and crunch, the joyous flavour of summer fruit, and a gorgeous caramel depth and spicy warmth from absolutely delicious biscuits. 0% chocolate strawberry mousse, 64% sauce, strawberries, 70% pink peppercorn, pepita and sea salt biscuit. Last, but in my world of course not least, the petit fours. A chocolate from each of our chefs. Paul’s chocolate was a study in elegance, a clean rectangle in which sesame, coconut and soy seasoned and balanced Duffy’s 65% chocolate. This is delicate, creamy, with a fine peanuttiness. Peter’s chocolate is physically a more robust affair, the focus on the flavours, rather than the chocolate technique. It is none the worse for that. I adored it! Original Beans Cru Virunga 70% is combined with tamarind and pickled ginger in a ganache, which is then rolled in an aerated crumb of the chocolate. Again a textural treat, this is a wonderfully new and ballsy set of flavours, and yet, there is nothing outrageous in the eating, nothing the palate cannot simply relish. Sharp tamarind and the warmth, sweetness and delicate acidity of the ginger combine and draw out the innate fruitiness of the cacao. A new one on me – that made perfect sense. Tempted? You’ve no soul if you aren’t. 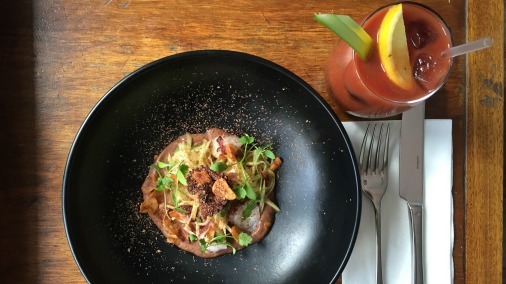 Peter and Paul’s collaborative menu will be at Providores for the month of July. And if, when you are there, you see a long legged dark-haired thing in the corner, covetously guarding an extra large portion of noodles she has managed to blag, that’ll be me! NB. With many thanks to Tom Moggach, the photographer, for all the pictures in this post. I apologise that the format of my blog has required them to be edited in a way that doesn’t do them full justice.